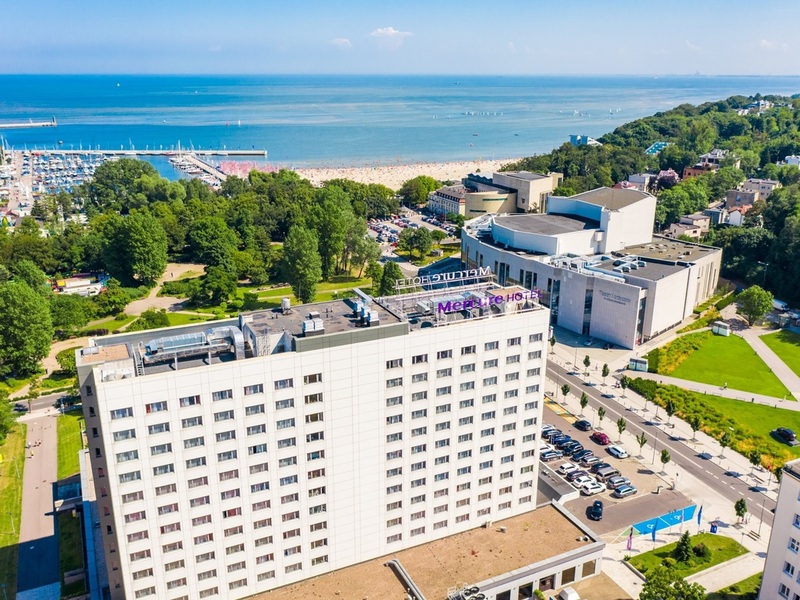 The Mercure Gdynia Center hotel is situated in the city center, just a short walk from the beach, the Seaside Boulevard - the most popular walking area in Gdynia - and the marina. Guests who enjoy cultural attractions will definitely appreciate the nearbyMusicalTheatre, Oceanography Museum and Military Naval Museum. The hotel is ideal for both those wishing to spend their vacation by the sea and for business travelers. Extreme friendly staff, friendly reception, nice restaurant, equilibrate menu with local and topical dishes, room super clean, shower and bath, aprecated really a lot, breakfast with extreme rich offer. Choice for every kind of breakfast. The on-site hotel parking lot is a mess. It seems the hotel has no control over it. On the nights when there is a performance in the Gdynia Music Theatre (located just acroos the street) there are hundreds of cars in the street and unfortunately the people who are NOT hotel guests park their cars there. Therefore, the parking lot in front of the hotel gets full very quickly. However, there are NOT any signs that could warn the potential hotel guests about it before entering the parking lot. One gets fully aware of that only when they go all the way up to the parking ticket facility. In case the parking lot is full a hotel guest is forced to back up their car and eventually go all the way around the hotel to the parking lot located at the back of the hotel. That parking lot is not easy to find and seems unsafe and neglected. There is no adequate lightning at night, it has not been renovated in years and occasionally there are some strangers looking as they would be some local homeless people. It doesn't feel like the hotel management pays any attention to that area at all. To make things worse the hotel employees have no knowledge whatsoever of the theater repertoire. In the case when the hotel guest finds the hotel parking lot fully taken by the theatre visitors she or he is not offered any information as to when eventually the hotel parking lot may be available again. This situation is absolutely unacceptable. I cannot understand why the hotel guest is less valuable customer to the hotel management than the random, casual driver just looking for some place to park. Many front desk employees are terribly undertrained. They are all kind and smiley but completely clueless and helpless. Therefore, to handle even a simple guest's request is often beyond their abilities. During my recent stay in the so called privileged room I requested two pairs of slippers which were missing in my room. The front desk employee I was talking to had no idea what the slippers are and why they should be provided to the hotel guests staying in that room. She was trying to persuade me that I am wrong and that slippers were never provided to any guests in that hotel. Of course I knew that was a complete nuisance but thankfully the front desk manager steppped in and quickly solved the problem. Somehow, the slippers miraculously appered in my room in less than 15 minutes. Hovever, it would be unfair not to mention those few trully dedicated and professional employees whom I encountered during my recent stay. Among those ones there is one especially highly professional employee with exceptional customer oriented approach and attitude who is worth mentioning. Her name is Malgorzata and to my knowledge she works in the breakfast restaurant as that is where I saw her every morning. She is truly the essence of old-fashioned kind of Ritz-Carlton customer service. I would visit Gdynia, Poland almost every year for the past 6 years. Although there are many choices including the nearby Courtyard by Marriott Hotel, Malgorzata is one of only few reasons why I keep coming back to the Mercury Gdynia Hotel. Stayed with the family 2+1 in family room which was very comfortable, clean and equipped with all facility what was expected. super helpful staff. great breakfast. clean and pleasant room. sauna and swimmingpool was great, although it would be nice to add to the hotel description that it is a public swimmingpool and sauna, as it came as a bit of a surprise. Average room, with a superb view. The main thing I liked a lot - a very good service, starting with a front desk and ending with the cleaning staff. And last, not least breakfast servants very helpful and with a smile. The outside weather did not cooperate, but inside the property - a friendly, "homy" feeling. Thank you. A nice, large swimming pool, even if open to general public, which makes it a bit crowded in the evening. Excellent service. A high quality wifi. Delicious breakfast with some regional dishes (different type of herring). Comfortable bed. Stunning view from the hotel window, good food for breakfast, friendly staff. Downside: renovation work next to my hotel room, unnecessary fire alarm followed by a long wait for lifts going operational again, no city plans in the hotel, insufficient info on cultural events and tourist attractions. very good service, really nice and professional staff. Extremally cosy room that fully meats our family needs. Not many times I can stay so close to the sea port , theater, cinema, city center and the beach. Thats all was just a few hundred meters from my bedroom. A beautiful place especially if you want to have a sea view in the morning and look on ships entering and leaving the port. I have stayed at the Mercure in Gdynia on a number of occasions and it is a perfect base for exploring the Trojmiasto (Gdynia, Sopot and Gdansk) area. It is in a great location close to the promenade and sandy beach, as well as to the theatre, cinema, restaurants, bars, and main shopping street. The central railway station (Glowna) is around 1km away for trips to Gdansk, and there is a trolleybus stop 200m away from where the route 21 will take you to the seaside resorts of Orlowo and Sopot. The staff are friendly and helpful, and the buffet breakfast is excellent. There is also a swimming pool and gym. A good place to stay without the premium prices of accommodation in Gdansk and Sopot. Welcoming, warm, room was ok - clean but shower would need more deep cleaning, pool was definitely plus, missed gym. Breakfast was great with local produce. Lift situation was disappointing as there are only 3 lift and not available stairway which could be much quicker. Nice hotel, great view, delicious breakfast and big swimming pool. The hotel is very nice - spacious rooms. The staff is exceptional. We where upgraded to a higher floor by a very friendly receptionist and the service at the bar was great.